Nancy and Jerry are amazing to work with. They are flexible and the food quality is outstanding! I would recommend them always for your event! Thank you so much Jen!!!! It was great meeting you and your families and our pleasure to cater your big day!! My fiancé and I met with Grady’s and they were nothing short of flexible and SO friendly! Custom menu, great price, plates and silverware that look completely real, & DELICIOUS food! They are very knowledgeable and think of every detail. Their brisket is mouth watering & we cannot wait to have everyone try their food! Thanks Chelsea & Skylar!!! We are looking forward to feeding your family and friends on your big day!!! Thank you for choosing us, we know you have many choices and truly appreciate it!! Time will fly!!! Grady's catering is the most reasonably priced for the best quality!! They serve food buffet style and their food is AMAZING! You really can't beat this kind of deliciousness. Plus its family owned so you know they will take care of you! I would recommend them to anybody. We're looking forward to your big day!!!! The staff at Gradys was amazing! The food was delicious and the price is very reasonable compared to other caterers. We would definitely use them again for another event! Grady's made the catering process very easy. They had experience at our venue, a flexible menu, and everything tasted great! Thank you!! We enjoyed meeting you guys were amazing to work with!! We wish you the best! This company is amazing. They made this process so easy for us, making suggestions to streamline the process and even referring me to a very affordable place for my wedding cake (on top of which they were offered to take care of transporting my wedding cake and serving it). For an extra $2 per person we had silverware and glass plates which really made the meal much nicer. The serving staff accommodated my gluten free diet, they treated my guests with respect and they were fabulous about clearing the tables. My guests all raved about how delicious the meal was. I can't say enough good things about this company! They have real experience with the industry in the southern Michigan area and they operate with high class and professionalism. Thank you Tom & Andrea!!! 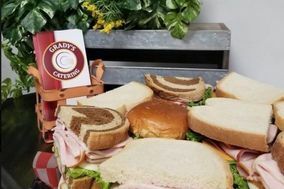 Gradys catered my daughers wedding. I could not have been more happy. From start to finish. The owners are very friendly and Keep in touch. And the food was excellent. The service was great! Thank you so much!! Very happy! Grady's was fantastic to work with from start to finish. The attention to detail, taste and presentation were all on point. Nancy was so accommodating to my never ending changes and requests. I would highly recommend Grady's to anyone! The food was wonderful! I definitely recommend the brisket! We had many of the wedding guests tell us it was the best wedding food they had! We even had a small hiccup with the cake cutting, but everything was handled and we are very glad for it!